Ballet Folklorico of Dallas, Creative Tango, Dallas Ballet Center, Texas Ballet Theater School, are just a few of the dance companies, Texas dance schools, dancing organizations and dance wear suppliers that that can be found in our comprehensive Directory of Texas Dance Companies. Our vision is that Children can be taught a sense of honor and pride of their heritage while learning and growing together. 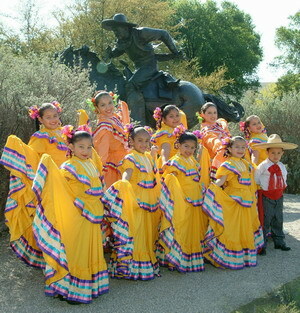 The Ballet Folklorico of Dallas was founded in 2002 under the direction of Alice Marie Arriaga. Housed at the Ice House Cultural Center for many years decided to change their location to the West Lake YMCA to better serve the community. The groups consist of students from 5 to 18. The talented and energetic dancers of the Ballet Folklorico of Dallas are committed to promotion cultural enrichment, awareness and to educate future generations on traditional Folklorico. The group shows our youth discipline, respect, self-esteem, how to learn and grow together. The group strives to be completely traditional to each folklorico region, practicing the dance steps that are the accepted dance norms in Mexico . Ms. Arriaga’s choreography, traditional movements, patterns and vibrant costumes that are indigenous to the regions are a certainty to give audience an enjoyable performance. Costumes are brought from Mexico or made locally with careful observance to the area design to keep their originality. There are many fine dance schools in Texas. I know I am in contact with them as we supply a range of high quality dancewear products like leotards, dance pants, dance dresses and other dancing apparel. Bangkok Companies supplies an amazing range of dancewear from Thailand. I have looked at these dance garments and dance accessories in detail. There is only one word to describe them Superb. For more details click on the pictures or send an email to bangkokcompanies@gmail.com We regret at this time we can only satisfy Texas wholesale dancewear requests. PO Box 131290 TX 75313.1290 Dallas, Texas U.S.A.
3676 Rickshaw Drive TX 75229 Dallas, Texas U.S.A.
Harry Hines Blvd 3630 Sammons Center for the Arts TX 75219 Dallas, Texas U.S.A.
Dance School, tuition, Performing original, primitive, ancient, Andalusian dance. Castanets in Spanish music and dance help to express both rhythm and melody. Flamenco has both male and female aspects. Learn proper finger articulation that leads to clear sounding castanet playing. Understand them and play effectively. Castanets that talk, sing, and help scream out your emotions. Rhythm understood. Heartfelt satisfaction. 1703 Tabasco TX 75211, Dallas U.S.A.
PO Box 803641 75380 Dallas, TX U.S.A.
PO Box 728 TX 75065, Lake Dallas U.S.A.
Middle Eastern dance instruction, performance, and education. PO Box 227496 TX 75222 Dallas, Texas U.S.A.
Dance teacher, author, public speaker, advocate for educational reform through the power of the arts . Annually hosts the Folklorico Festival of Texas. 3630 Harry Hines Blvd. TX 75219 Dallas U.S.A.
12485 Montego Plaza TX 75230 Dallas U.S.A.
13625, Purple Sage Rd TX 75240 Dallas U.S.A. Traditional folkloric music and dances of Mexico, Central, South America and the world folklore art form. Educational dance programs, public performances and artistic enrichment events. Professional commercial dance company such as theme shows, backup dancers, variety shows, educational dance shows, etc. and also offers workshops in dance and dance products. 2705 Cape Brett Dr TX 75022 Dallas U.S.A.
Irish dance classes in Dallas, Lewisville and Arlington, Texas. 7302 CR 2829, Mabank TX 75156 Dallas, Texas U.S.A.
American Traditional Contras, Squares, Mixers, Couples; Annual dance/music festivals: "When in Doubt, Swing!" and "Fiddler's Dream"
2560 ALPACA PASS APT.C TX 75211 DALLAS U.S.A.
152, PO Box TX 75034-5671 U.S.A.
PO Box 871264 Mesquite TX 75187 Dallas, Texas U.S.A.
502, Lakeside TX 75149 Mesquite, Texas U.S.A.
213, 2515 Inwood Rd TX 75235 Dallas U.S.A.
Ballet Folklorico Huehuecoyotl is welcome to students of all ages. The pursuit of the continuation of Mexican culture thrives in this academy as well as interests in modern latin music. 12300 Inwood Road, Suite 124 TX 75244 Dallas U.S.A.
3219 Healey Drive TX 75228-3903 Dallas U.S.A.
3219 Healey Dr. Dallas TX 75228 Texas U.S.A.
8641, Redondo TX 75218 Dallas U.S.A.
3020 East Meadows TX-75150 Dallas U.S.A.
2627 Flora Street TX 75201 Dallas, Texas U.S.A.
P.O. Box 750356 TX 75275-0356 Dallas U.S.A.
11838 Cromwell Drive TX 75234 Dallas U.S.A.
PO Box 728 TX 75065 Lake Dallas U.S.A.
1910 Firman Drive # 120 TX 75081 Richardson, Texas U.S.A.
4422 Live Oak Street TX 75204 Dallas, Texas U.S.A.
176 Spring Creek Village TX 75248 Dallas, Texas U.S.A. Tel. 11661 Preston Road # 105 TX 75230 Dallas, Texas U.S.A.
7130 Campbell Road TX 75248 Dallas, Texas U.S.A.
5211 Merrimac Avenue TX 75206-5825 Dallas, Texas U.S.A.
6318 Gaston Avenue TX 75214 Dallas, Texas U.S.A.
5757 West Lovers Lane # 221 TX 75209 Dallas, Texas U.S.A.
8220 Westchester Drive TX 75225 Dallas, Texas U.S.A.
1902 Abrams Pkwy Dallas, TX 75214 U.S.A.
14560 Marsh Lane TX 75234 Dallas, Texas U.S.A.
8530 Abrams Road TX 75243 Dallas, Texas U.S.A.
15555 Wright Brothers Drive TX 75244 Dallas, Texas U.S.A.
315 Dal Rich Village TX 75080 Richardson, Texas U.S.A.
6815 Hillcrest Dallas, TX 75205 U.S.A.
12300 Inwood Road # 124 TX 75244 Dallas, Texas U.S.A.
6220 Gaston Avenue TX 75214 Dallas, Texas U.S.A.
246 Spanish Village TX 75248 Dallas, Texas U.S.A.
5211 Forest Lane # 108 TX 75244 Dallas, Texas U.S.A.
10675 East Northwest Highway TX 75238 Dallas, Texas U.S.A.
8313 Westchester Drive # B TX 75225 Dallas, Texas U.S.A.
P.O. Box 15038 TX 75201 Dallas U.S.A.
4915 West Lovers Lane TX 75209 Dallas, Texas U.S.A.
4216 Allencrest Lane TX 75244 Dallas, Texas U.S.A.
4416 Laren Lane TX 75244 Dallas, Texas U.S.A. Tel. 6815 Hillcrest Avenue TX 75205 Dallas, Texas U.S.A.
7600 South Loop 12 TX 75217 Dallas, Texas U.S.A.
5706 East Mockingbird Lane # 250 TX 75206 Dallas, Texas U.S.A.
240 Turnpike Avenue TX 75208 Dallas, Texas U.S.A.
402 Park Forest Center TX 75234 Dallas, Texas U.S.A.
9310 Forest Lane # 318 TX 75243 Dallas, Texas U.S.A.
17062 Preston Rd., #108 Dallas TX 75248 U.S.A.
5731 Richmond Avenue TX 75206 Dallas, Texas U.S.A.
606 North Edgefield Avenue TX 75208 Dallas, Texas U.S.A.
6162 East Mockingbird Lane TX 75214 Dallas, Texas U.S.A.
3548 High Vita Drive TX 75234 Dallas, Texas U.S.A.
6607 Hillcrest Avenue # 200 TX 75205 Dallas, Texas U.S.A.
6118 Luther Lane TX 75225-6202 Dallas, Texas U.S.A.
155 Ferguson Village Center TX 75228 Dallas, Texas U.S.A.
17738 Davenport Road TX 75252 Dallas, Texas U.S.A.
17818 Davenport Road # 11a TX 75252 Dallas, Texas U.S.A.
P.O. Box 750356 Dallas, TX 75275 U.S.A.
PO Box 750356 TX 75275-0356 Dallas, Texas U.S.A.
11722 Marsh Lane # 336 TX 75229 Dallas, Texas U.S.A.
8220 Westchester TX 75225 Dallas, Texas U.S.A.
804 West Dallas Street TX 77301 Conroe, Texas U.S.A.
2501 Flora Street TX 75201 Dallas, Texas U.S.A.
3721 North Hall Apt. 606 TX 75275-0356 Dallas, Texas U.S.A.
PO Box 15065 TX 75201-0065 Dallas, Texas U.S.A.
13608 Midway Road TX 75244-4358 Dallas, Texas U.S.A.
9463 Green Terrace Dr. TX 75220 Dallas, Texas U.S.A.
3731 W. Beverly Dr. TX 75209 Dallas U.S.A.
7609 Riverbrook TX 75230 Dallas, Texas U.S.A.
PO Box 1290 TX 75221-1290 Dallas,Texas U.S.A.
316 Dallas Dr.P.O. Box 425942 TX 76204 Denton U.S.A.
2211 Gus Thomasson Road TX 75228 Dallas, Texas U.S.A.
4525 Lemmon Avenue TX 75219 Dallas, Texas U.S.A.
2120 West Jefferson TX 75218 Dallas U.S.A.
PO Box 801416 TX 75380-1416 Dallas, Texas U.S.A.
18725 North Dallas Parkway, apartment 2515 TX 75052 Dallas, Texas U.S.A.
718 N. Buckner Blvd. suite 324 TX 75218 Dallas U.S.A.
School, Mexican dances, Children, Youth and Professional Companies. 8017 Lake June Road, Suite H TX 75217 Dallas, Texas U.S.A.
3101 North Fitzhugh Avenue, Suite 301 TX 75204 Dallas, Texas U.S.A.
216 Concho Street # M TX 75206 Dallas, Texas U.S.A.
2300 Auburn Ave. TX 75214 Dallas U.S.A.
PO Box 1290 TX 75221-1290 Dallas, Texas U.S.A.
6206 South Freeway, Suite E TX 76034 Fort Worth, Texas U.S.A.
2485 Forest Park Boulevard TX 76110 Fort Worth, Texas U.S.A.
P.O. Box 64311 TX 76164 Fort Worth U.S.A.
Ensemble, folk dance group, dances from Mexico. 404 S. O Connor TX-75060 Irving U.S.A.
3803 Camp Bowie Blvd. TX 76107 Fort Worth, Texas U.S.A.
5302 Trail Lake Dr. 76133 Fort Worth U.S.A.
Ballet, Jazz, and Pilates instruction for all ages, beginner to professional. Adult and Teen Ballet classes available! 2485 Forest Park Blve TX 76110 Fort Worth, Texas U.S.A.
Retail dancewear, shoes and accessories, retail store and mailorder business. PO Box 612248 TX 75261-2248 Fort Worth, Texas U.S.A.
7325 Kuban Blvd TX 76120 Fort Worth Texas U.S.A.
Ballet, Jazz and Pilates instruction for all ages, beginner to adult! 1628 5th Avenue TX 76104 Fort Worth U.S.A.
Green Oaks Rd Fort Worth, TX 76116 U.K.
1705 Deauville Crescent TX 76112 Fort Worth, Texas U.S.A.
6751 Rufe Snow Drive TX 76148 Fort Worth, Texas U.S.A.
4949 Bryant Irvin Road North TX 76107 Fort Worth, Texas U.S.A.
Ballet Folklorico Azteca de Fort Worth, Inc.
2909 Schwartz TX 76106 Fort Worth, Texas U.S.A.
1300 Conner Avenue TX 76105 Fort Worth, Texas U.S.A.
4854 White Settlement Road TX 76114 Fort Worth, Texas U.S.A.
5050 Trail Lake Drive TX 76133 Fort Worth, Texas U.S.A.
PO Box 11652 TX 76110 Fort Worth, Texas U.S.A.
917 University Drive TX 76107 Fort Worth, Texas U.S.A.
4809 Bryant Irvin Road N TX 76107 Fort Worth, Texas U.S.A.
3720 Altamesa Boulevard TX 76133 Fort Worth, Texas U.S.A.
3013 Joyce Drive TX 76116 Fort Worth, Texas U.S.A.
3559 Williams Road TX 76116 Fort Worth, Texas U.S.A.
1901 Montgomery Street TX 76107 Fort Worth, Texas U.S.A.
PO Box 743 TX 76101 Fort Worth, Texas U.S.A.
3328 West 7th Street TX 76107 Fort Worth, Texas U.S.A.
4318 West Vickery Boulevard TX 76107 Fort Worth, Texas U.S.A.
3543 South Hill Street # 9 TX 76109 Fort Worth, Texas U.S.A.
6617 North Beach Street TX 76137 Fort Worth, Texas U.S.A.
6841 Green Oaks Road # B TX 76116 Fort Worth, Texas U.S.A.
2715 Altamesa Boulevard TX 76133 Fort Worth, Texas U.S.A.
4200 Country Day Lane TX 76109 Fort Worth, Texas U.S.A.
2216 5th Avenue South IA 50501 Fort Dodge, Iowa U.S.A.
P.O. Box 11461 TX 76110 Fort Worth, Texas U.S.A.
5640 Denton Highway TX 76148 Fort Worth, Texas U.S.A.
1114 Norwood Street TX 76107 Fort Worth, Texas U.S.A.
4251 Camp Bowie Boulevard # B TX 76107 Fort Worth, Texas U.S.A.
3803 Camp Bowie Fort Worth, TX 76107 U.S.A.
4701 Pershing, Apt. A TX 76107-4927 Fort Worth U.S.A.
2640 Forest Park Boulevard TX 76110 Fort Worth, Texas U.S.A.
6101 Watauga Road TX 76148 Fort Worth, Texas U.S.A.
6350 Glenview Drive TX 76180 Fort Worth, Texas U.S.A.
3909 Highway 377 South TX 76116 Fort Worth, Texas U.S.A.
6411 McCart Avenue TX 76133 Fort Worth, Texas U.S.A.
8512 Thousand Oaks Drive TX 76180 Fort Worth, Texas U.S.A. Box 297910 Fort Worth, TX 76129 U.S.A.
PO Box 297013 TX 76129 Fort Worth, Texas U.S.A.
6703 Meadowbrook Drive TX 76112 Fort Worth, Texas U.S.A.
PO Box 11461 TX 76110 Fort Worth, Texas U.S.A.
1201 Wesleyan TX 76105 Fort Worth, Texas U.S.A.
4505 Roxie Street TX 76117 Fort Worth, Texas U.S.A.
6900 Denton Highway, Suite 107 TX 76148 Fort Worth, Texas U.S.A.
6845 Green Oaks Road TX 76116 Fort Worth, Texas U.S.A.
TCU Box 297910 TX 76129 Forth Worth, Texas U.S.A.
2316 Ridgmar Boulevard, apt. 155 TX 76116.2227 Fort Worth, Texas U.S.A.
6149 Bianca Circus #149 TX 76132 Fort Worth, Texas U.S.A.
5640 Tourist Street TX 76117 Fort Worth, Texas U.S.A.
2531 5th Avenue TX 76110-2509 Fort Worth, Texas U.S.A. Box 11652 TX 76110 Fort Worth, Texas U.S.A. Tel. Contemporary Dance/Fort Worth promotes the art, artists and audiences for modern dance through performance and education in schools and the community.